FlowGuard Gold CPVC Blog | Lubrizol Advanced Materials, Inc. Discover why FlowGuard Gold Pipe and Fittings is the most well-established non-metallic piping product in the market. If you’ve already seen our previous post on chemical incompatibility, you know that all materials can be subject to damage from incompatible chemicals – even high quality materials like FlowGuard Gold® CPVC. That’s why it’s important to consider chemical compatibility – how the pipes may react to materials and chemicals that touch them – during the project’s design and installation phase to ensure the piping system performs as intended for the life of the system. Not all piping materials are the same, but all piping materials can be vulnerable to adverse effects from incompatible materials. The specific chemistries involved in determining compatibility will vary based on what piping materials you use and what ancillary building products are used with them. Homeowners and contractors demand reliable, high-quality piping systems that deliver safe, clean drinking water over the long term. 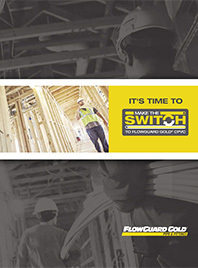 FlowGuard Gold® CPVC pipe and fittings have a reputation for quality and 60 years of proven performance to exceed homeowner and contractor expectations. Potable water piping systems have a primary goal: to deliver safe and clean water to drink. Plumbing system materials, therefore, must meet specific performance criteria to ensure they are suitable for use in a potable water supply. Piping materials are tested for their temperature and pressure-bearing capabilities, and in the case of polyolefin materials such as PEX, they are tested to determine their time to failure when exposed to chlorine. Beginning in 1957, the NAHB Reseach Institute launched its Research House program to develop new ideas, and performance specifications for new materials and equipment to improve the quality and/or reduce the cost of American home construction. Plumbing system failures can be problematic and costly for a homeowner, builder or plumber. Unfortunately, many plumbing systems use components made from polyolefin materials which are known to degrade and fail when exposed to the chlorine-based disinfectants commonly found in municipal drinking water, especially at elevated temperatures and pressures. Homebuilders and plumbers alike need to have confidence in the plumbing systems they specify and install in new homes. Where that confidence comes from, though, is critically important. With Lubrizol CPVC, that confidence is possible based on a 60-year proven track record – not only in hot and cold water distribution, but also in some of the harshest operating conditions possible. Fire risk is an important factor when designing piping systems for homes. That’s why piping systems should always be part of the discussion when considering combustion safety, as different types of pipes respond to fire in different ways.